Iran and the fate of its Christians, as the Islamic Republic turns 40 years old, could perhaps remind one of Forrest Gump’s quote: “Life is like a box of chocolates. You never know what you’re gonna get.” The Christian community of just a few thousand Muslim converts in 1979, after four decades of state-run repression, has grown to several hundred thousand, or even one million according to some sources. Churches have been closed down, the Bible in Persian banned, Christian leaders murdered, and hundreds of women and men sent to jail and forced into exile. This has been part of the Islamic Republic’s policy over the past 40 years, with the aim of eradicating Muslim converts and Persian-speaking churches in Iran. This policy does not respect any red lines, but it has failed. In 2019, we can witness the birth of a new Christian minority in Iranian society, beyond ethnic lines and despite harsh persecution. This minority is deprived of basic rights, and, each Christmas, they must wait to see if security forces will attack. 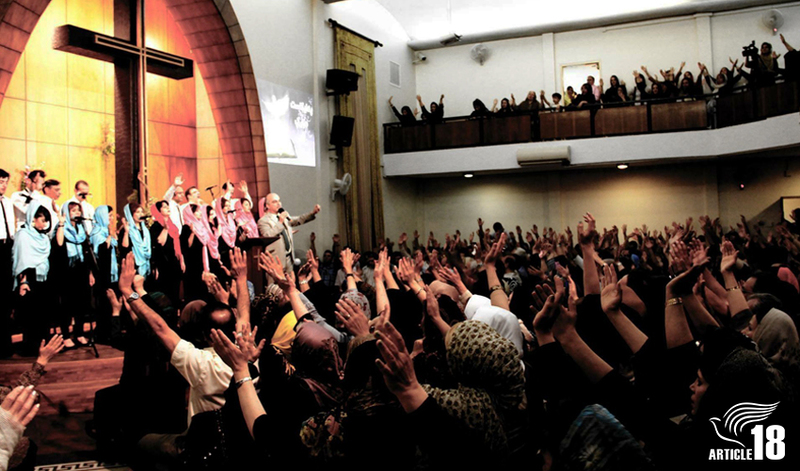 Attacking Iranian Christians began soon after the Islamic Revolution’s victory. Arastoo Sayyah, a Muslim convert and pastor of the Anglican Church, was killed by unknown murderers only eight days after Ayatollah Khomeini came to power. After that, the property of the Anglican Church was seized by the Islamic Republic. The government then stepped up the pressure on Farsi-speaking pastors and Muslims converts. While Iranian leaders claim that no one has been imprisoned for his or her beliefs or religion in Iran, Hossein Soodmand, a pastor of the Assembly of God-Mashhad congregation, was detained and tortured in December of 1990. And Mehdi Dibaj, a Christian activist, was imprisoned for nine years for his beliefs, only to be murdered and his body cut into pieces in February 1994, one month after his liberation. Pastors from traditionally Christian ethnic groups who proselytise or perform ministries of service to the Muslim-origin population, such as Haik Hovsepian Mehr and Tateos Mikaelian, two Protestant church leaders, also became the victims of Islamic Republic death squads in 1994. Since the revolution, at least seven church leaders in Iran have been killed, and hundreds of Christians have been interrogated and imprisoned. The Bible is banned in Persian, and many churches have been closed down. In 2010, Iranian Supreme Leader Ayatollah Ali Khamenei openly warned about the country’s underground house churches, saying they “threaten the Islamic faith and deceive young Muslims”. International organisations have repeatedly made statements on human-rights violations, the repression of civil society and the rights of minorities, including Christians, in Iran. The Islamic Republic’s leaders take every opportunity to present an upside-down reality regarding human rights in Iran, during international meetings and interviews with Western media. Former Iranian president Mahmoud Ahmadinejad and current foreign minister Mohammad Javad Zarif often use Western platforms for government propaganda, without facing any challenge from the host, despite countless documents that prove human-rights and minorities-rights violations during the last 40 years. Zarif tries to convince Western audiences that people are not persecuted in Iran because of their beliefs. Zarif recently said at a meeting of the US Foreign Relations Council, a think-tank in New York, that people are not being imprisoned for being Baha’i, or due to any personal convictions, and that Christians and other minorities are recognised in the Islamic Republic’s Constitution and have many privileges. Western hosts appear to be paralysed, preferring to make their guests happy, and, despite the hundreds of reports of systematic human-rights violations in Iran, including the crackdown on Baha’is, civil-society activists and Christians, they keep silent or even nod their heads, as if “the show must go on”. A few months after Zarif’s claim, Amnesty International in its report called 2018 a year of “shame” for the Islamic Republic and reported that 171 Christians were arrested in the previous 12 months. The Islamic Republic recently showed once more that it does not forget the Christian community, when it arrested hundreds of them over the Christmas period of December 2018. Under this Orwellian regime, baseless accusations against Christians have changed as the Islamic Republic’s propaganda machine has failed; false accusations range from acting against national security to sabotaging the economy. In reality, the Iranian Constitution recognises Christian natives, such as Armenians and Assyrians, who are second-rate citizens but are not hunted down like Muslim-origin Christians. The explosive growth of house churches around the country despite 40 years of repression shows that a Christian minority exists, beyond ethnic lines, as an indigenous community of up to 800,000 or even one million members. They are a community deprived of basic rights, including even having a Bible in their mother-tongue, and they walk under the shadow of death. Iran is a signatory of the Universal Declaration of Human Rights that considers the freedom of religion a right. International organisations, such as the United Nations and the European Union, must apply pressure and urge the Islamic Republic to respect the basic human rights of the Iranian Christian minority. This ought to be translated into the language of each reader and sent to the foreign minister in his/her country as well as newspapers and religious programs in radio and tv! Pray for the Iranian converts seeking refuge in this country but being denied it.